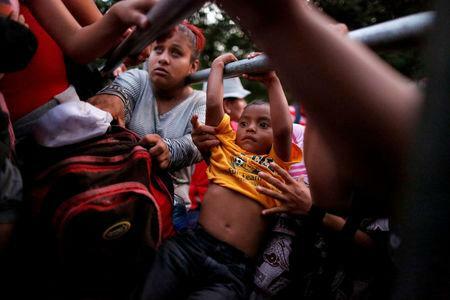 "The migrants had already broken through the first police barricade on the Guatemalan side of the bridge. After a while, they moved towards the second barricade on the Mexican side," said Marcelino. "Suddenly women and children formed a line and started to walk towards the police. There was a bit of pushing and shoving, and then things started to get increasingly chaotic." "To me this shows how desperate these people are. They are willing to cross rivers with strong currents, to lose any belongings they had, to struggle through the water with their children." "A family that had made it to the middle of the river was handing their children to other men to help them reach the shore," he said. "This photograph begs the question: why would a family leave home and not only risk their own lives but also the lives of their children by doing such extraordinary things? What propels someone to walk without knowing where they will next break bread or quench their thirst?"